I'm still debating on whether or not I should be doing this... because I'm not too sure on how long my inspiration will last... and school is almost starting for me. Ughyuu... what to do, what to do? Phantom of the Opera? Sounds like a nice idea, but I think I like most the one with Princess Nanoha turned into stone. 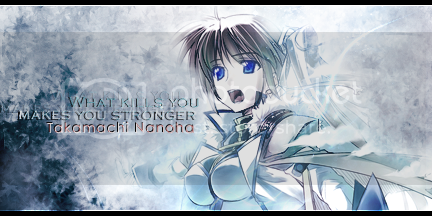 I finally decided to name my 'Princess Nanoha turned to stone' Fic to: "Rainbows after the Rain." I'll be posting the beta version chapter one after posting my chapter nine which will be sometime around this week since I'm in super writing mode today.